Car sales are falling in China this year but one brand is speeding ahead: The national “Red Flag” sedan is flying high, powered by purchases from the government, state companies and patriotic citizens. Beloved by Chairman Mao Zedong, the luxury car — “Hongqi” in Chinese — is getting a new lease of life as President Xi Jinping makes a push for national economic “self-reliance” amid a trade war with the United States. Air China put out a tender for its first Hongqi H7 sedans in October — which have a starting price tag of around 250,000 yuan ($37,000). “It’s our national brand for our company’s management,” said Xue Ning, a purchasing manager, noting he did not know how many the firm would buy. Owned by China’s state-owned FAW Group, Hongqi is getting state support despite Xi’s repeated pledges to further open up China’s economy and create a more level playing field for foreign firms. “State-owned enterprises should drive state-produced cars,” said Li Gang, who coordinated the purchase of a Hongqi sedan for the general manager of a China Unicom branch in Henan province. Provinces rolled out purchasing regulations benefitting “domestically-developed” cars like the Hongqi brand, which was revived by FAW in 2012. Once ubiquitous black Audis circling the nexus of power in Beijing have gradually been replaced by the new black Hongqi sedans. FAW also built those Audis — but in partnership with Volkswagen. Overall car sales in China are set to fall this year for the first time in decades as the economy slows — but Hongqi sales have jumped 662 percent in the first 10 months of the year from the same period last year, to 23,838 vehicles, the company said. The car industry is set for a major shift after Xi decided to begin relaxing ownership rules, which had long restricted foreign automakers to holding no more than a 50 percent stake in their China operations. But the liberalisation could still fuel favouritism for state companies. Xi has preached the need for China to develop on its own and pushed industrial policies that favour domestic companies like the state-owned FAW Group. The government’s major “Made in China 2025” policy calls for domestic carmakers to control 80 percent of the electric vehicle market by 2025 as Beijing phases out fossil fuel cars. 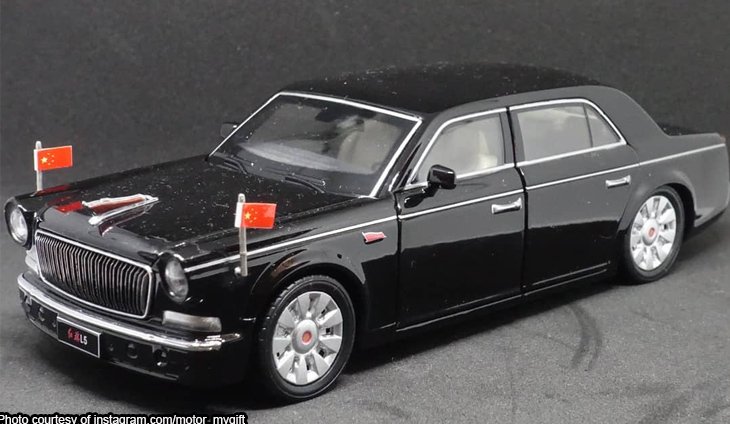 Yuan Peiye, president of the Jin-Cha-Ji National Anti-Japanese Seminar, recently traded in his black Audi for a second Hongqi H7 sedan. “It’s a symbol of patriotism,” said the 54-year-old. “When I’m driving it, my mood is very comfortable, very proud, not like the discomfort I feel when driving a foreign car,” Yuan said from a Hongqi showroom. Front and centre was a display of the brand’s red history emblazoned with words from Xi: “I look forward to more Chinese sitting in FAW produced Hongqi cars”. Patriotism is a top selling point. “In the hearts of our people, no brand can replace Hongqi,” said FAW party secretary Xu Liuping. “It brims with deep national sentiment, and the long-cherished wish to rise as a great power has been placed on it,” Xu told the Global Times this year. FAW is rolling out more than a dozen new Hongqi models by 2025, including two luxury SUVs and many electric models while developing an autonomous car in partnership with tech giant Baidu. The expansion requires capital: in October, 16 banks, including policy and state banks, announced a credit line worth more than 1 trillion yuan ($146 billion) to FAW — enough to purchase GM, Ford and Fiat Chrysler at their current valuations. The size of the credit lines do not represent the current capital needs of FAW, a person close to the company said, noting it is in the process of transforming into a world-class on-demand transport firm focused on self-innovation. “To this end FAW is vigorously developing the Hongqi brand,” the person said.